Paul Sanchez with Greg Joseph! UPDATE: Pittsburgh's own Greg Joseph has joined the bill! Paul and Greg know each other from back when The Clarks and Cowboy Mouth used to play shows together. This will be a very cool reunion. Another installment of the Frenchmen On Penn series at Pittsburgh Winery, bringing you the best music from New Orleans! Sanchez began writing songs and playing his first professional shows in the French Quarter before he turned sixteen. By the 1980’s, Paul was an established part of the New Orleans rock scene, playing in The Backbeats along with Vance DeGeneres, another native New Orleanian. He lived in New York City in the late 80's and was part of the now legendary Anti-Folk scene in the East Village. In January of this year Off Beat Magazine awarded Paul Songwriter of the Year 2014, he won three Best of The Beat Awards n 2010: Songwriter of The Year, Best Song of The Year, Best Folk/Rock Album for Stew Called New Orleans, his duet record with friend and collaborator John Boutte. In April of that same year Gambit Weekly awarded him Best Roots Rock Performer at The Big Easy Awards. Primarily a songwriter Sanchez has written songs for Darius Rucker of Hootie and The Blowfish, had a song in the country charts which was recorded by The Eli Young Band, and a song covered by Irma Thomas, the Soul Queen of New Orleans. Paul resides in the Treme neighborhood, where he sings and breathes everything New Orleans. 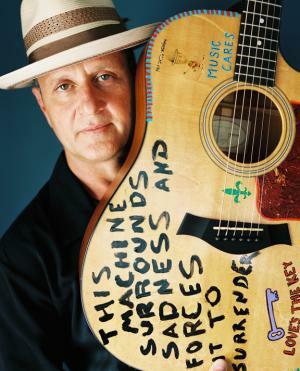 As a student at the Indiana University of Pennsylvania in the 1980s, Greg Joseph envied his musician dorm mates, so he purchased an acoustic guitar and taught himself to play. With three other IUP students, he formed a rock band called The Clarks and set out to make it in the music business. Over twenty-five years later The Clarks, still with all the original members, are both a hometown favorite and a bona fide mainstream success with major label record deals, national tours and airplay, and song placements in television and movies. Along the way, Joseph learned more than just how to play guitar. As a songwriter, bass player, singer and spokesman for The Clarks, he is a passionate musician and writer as well as an industry pro with a grass roots understanding of the art and business of music. In recent years, Joseph has expanded his professional portfolio to include commercial jingle writing. Working from his home recording facility, Sonic Dog Studios, Joseph has parlayed his talent for sinfully infectious melodies into local and national radio and television spots for Toyota, Bud Light, The Citizens Bank of Martins Ferry, OH, Northwest Consumer Discount Company and more.